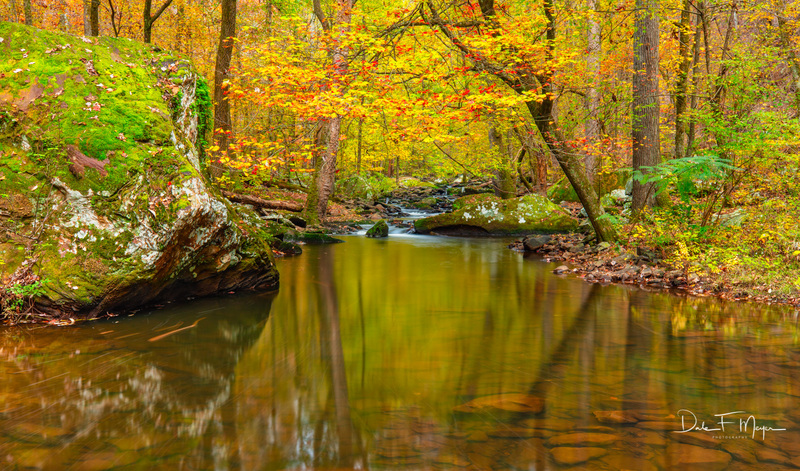 Late Fall on Cedar Creek in the Petit Jean Valley, with a mirror of smooth water flow painted with the reflections of fall colors and streaks of leafs as they follow the creek to their resting place for the winter. The cycle of fall moving toward winter is once again being carried out in all its beauty. Photo © copyright by Dale F. Meyer. My Print only orders are made on Fine Art Museo Textured Rag paper. This is a heavy weight archival 100% cotton semi-gloss Watercolor paper of very long life that produces rich colors with very strong contrast. This paper is top museum grade quality of significant weight and feel. I will never use anything but the very best quality materials to produce my prints! If you do not see a size that workes for your application, I can often custom size a print for your needs. Just use my contact page and let me know what you need. We will go from there! Giclée (pronounced zhee-clay) is a super high quality ink jet process applied to high quality cansas products. Giclée fine art printing provides a luminosity and brilliance that represents the bright colors and contrast unique to my work, and produces artwork of higher quality than any other fine art canvas printing technique available today. Giclée fine art canvas prints have been proven to be fade resistant to 200 years. You just have to see one of these to appreciate its beauty! These Canvases are 3/4" in Depth and the edges are blacked out. They are not wrapped images. In other words the whole image is on the surface of the canvas. Any questions just ask. The "MegaPlaq" is a very beautiful ready to hang option for my prints. This process mounts a fine art ink print directly to eco-friendly wood, coated with acid-free moisture resistant barrier that seals the print with a special simi-matte UV Laminate. This sealant protects the print while eliminating reflections and enriching the contrast and clarity. The ready to hang mount is a French cleat hanging system finished with a beveled 1"-deep black edge, creating a classic, beautiful and durable print display that is designed to hang flush against the wall. This incredible display option is known as dye sublimation onto aluminum “Metal Print” and truly has to be seen to fully appreciate the amazing bold and brilliant colors this medium produces, it almost seems backlit! The finish is semi-gloss on a satin black edge ¾” single wall frame. This surface is very durable both scratch and water resistant and will last nearly 100 years longer than any paper print. This option is ready to hang with security mount hardware. This has quickly become one of my most raved print mediums. The PlexiPlaq is a crystal clear, high gloss surface using museum-grade ultra-violet and scratch resistant 3/16” acrylic of superior clarity and durability. It is a stunning way to display my prints! A fine art Metallic or glossy type print is face mounted in a fully acid-free manner to add extra depth and iridescence for a remarkably modern presentation. The front face is finished with beveled edges. A protective, acid-free black coating is applied to the back of the acrylic face-mounted print and completed with a 1/2″ black poly backing with concealed French cleat hanging system to give it a floating effect when mounted on the wall. Overall depth of product is 13/16” from front face to wall. Dale takes great pride and care in every step of the printing, careful packaging and shipping of every order and stands 100% behind the quality of each print. If you are not satisfied with your order Dale will gladly refund your money upon return of the print in the original packaging. For more information about Dales prints see the Prints Page.